I ordered a few things last weekend and the last of the items finally arrived yesterday. Don’t you just love mail days? 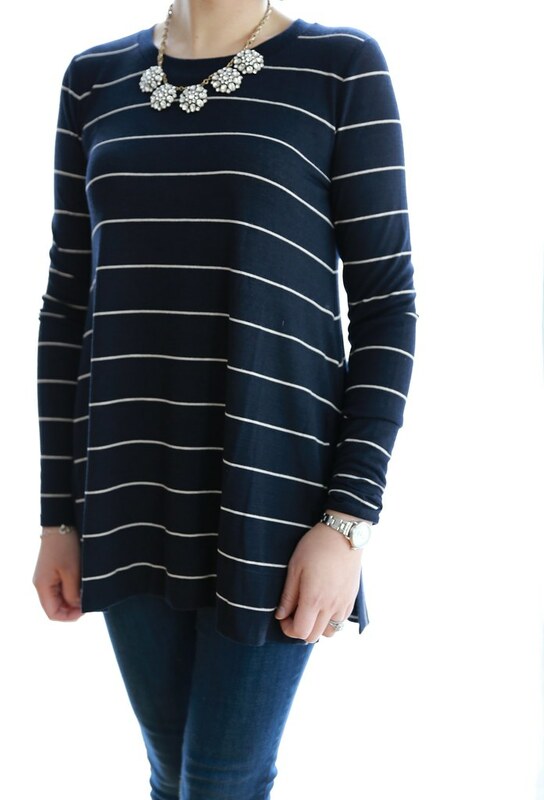 I’m obsessed with this textured striped top which I had previously tried on in size XS regular here. I ended up ordering it in XXS regular and it fits me perfectly. It has a swingy shape to it and the material is light so it’s perfect to wear year round. I also love this round crystal statement necklace which is very versatile as I’m finding that it pairs well with a lot of items in my closet. I’m also happy to report that my favorite white skinny ankle jeans are back in stock at Ann Taylor. They fit true to size (I took my usual size 25/0P) and the petite inseam is spot on hitting right above my ankle bone and the leg opening is narrow which helps to elongate my short legs. The fabric they used is also a good weight so they are not too thin and see through. I’m always on the lookout for new white jeans so I also ordered these frayed slim ankle jeans from LOFT to compare but I didn’t care for the kick-crop style. They ran a full size smaller since I fit size 26/2P as recommended by my True Fit profile online. I also ordered a few other statement necklaces including the one pictured below but I had issues with the crystal stone cluster necklace which arrived with one stone fallen off. I will have to bring it in store to exchange for a new one. Now that their packages are shipped in the poly-mailers I’m concerned that it doesn’t properly protect items such as jewelry which are prone to damage in transit especially if they’re not wrapped well. 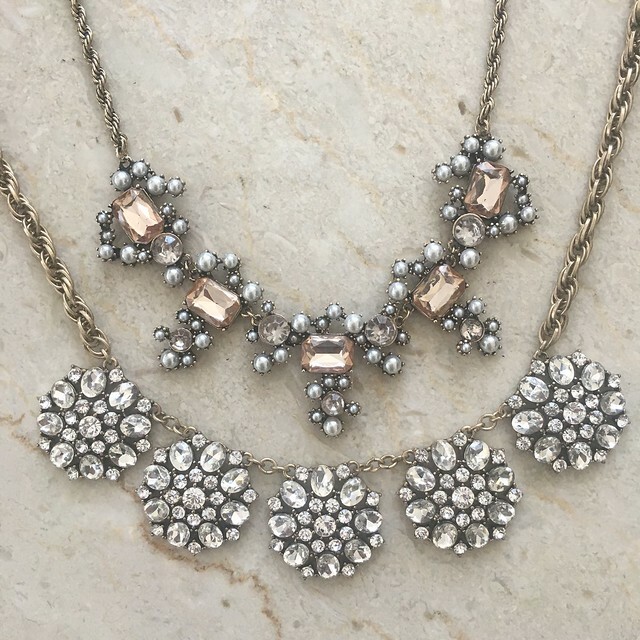 I need to style the pearlized crystal necklace which has a convenient 2″ extender so that you can easily adjust it to wear with various necklines. The metal is more brass than gold tone unlike what their online stock image picture represents. Here is the round crystal necklace with yet another top/recent purchase of mine. I bought this top after seeing it on Jenn@hauteofftherack. 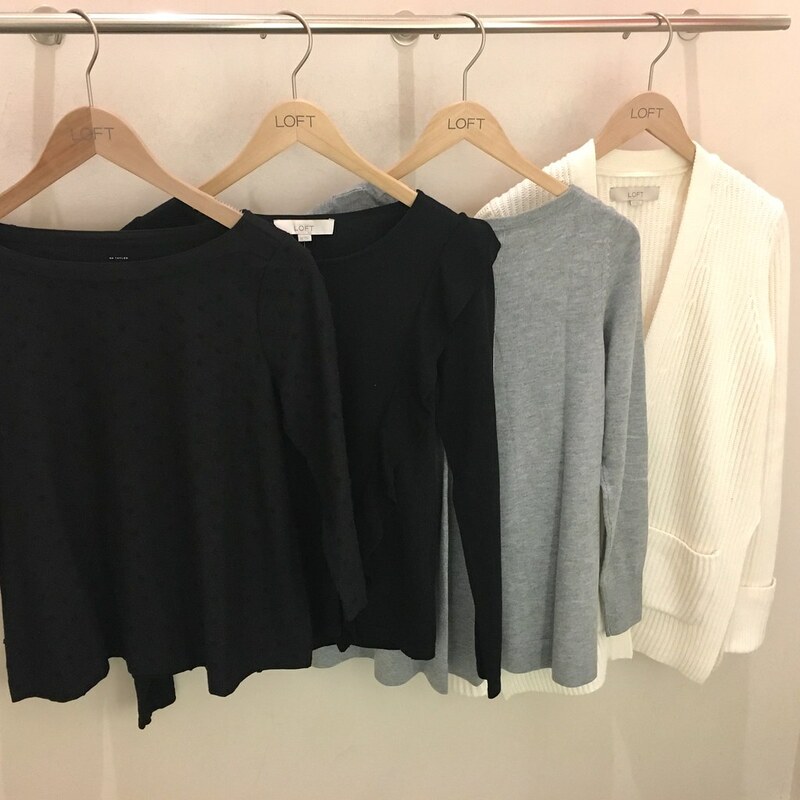 Get 50% off everything at LOFT. Use code NOEXCUSES. Select styles starting at $25. Valid in stores and online. I went in store this weekend to check out the new arrivals since last week. I found a few items that are currently only available in store (noted item numbers below) and not yet available for purchase online. 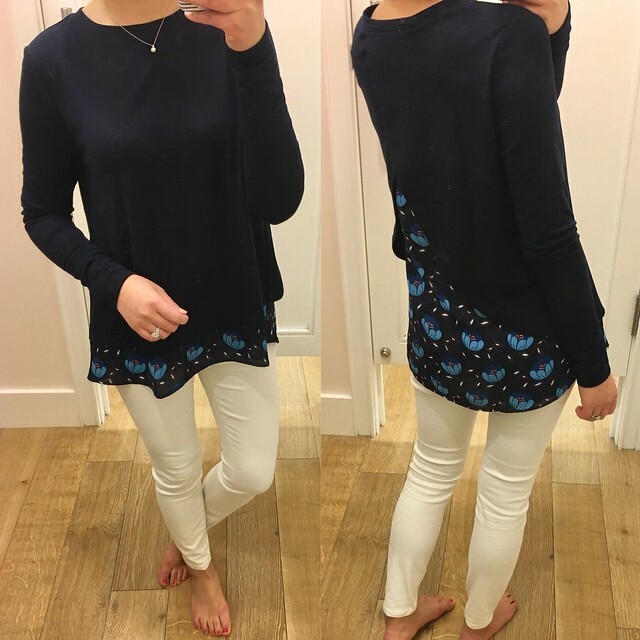 I tried on this adorable mixed media tee (it looks and feels more like a sweater) in size XS regular. I’d say that it fits true to size with a longer overall length that covers your front and backside nicely. 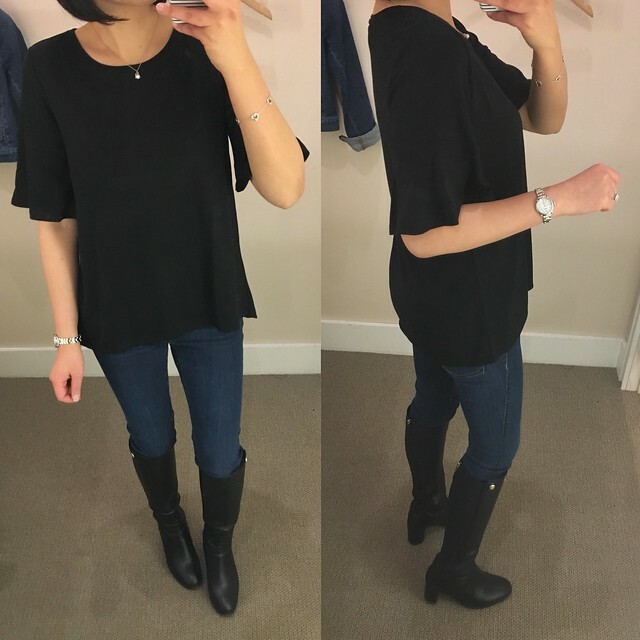 XS petite may be a better length for me since I’m 5′ 2″. 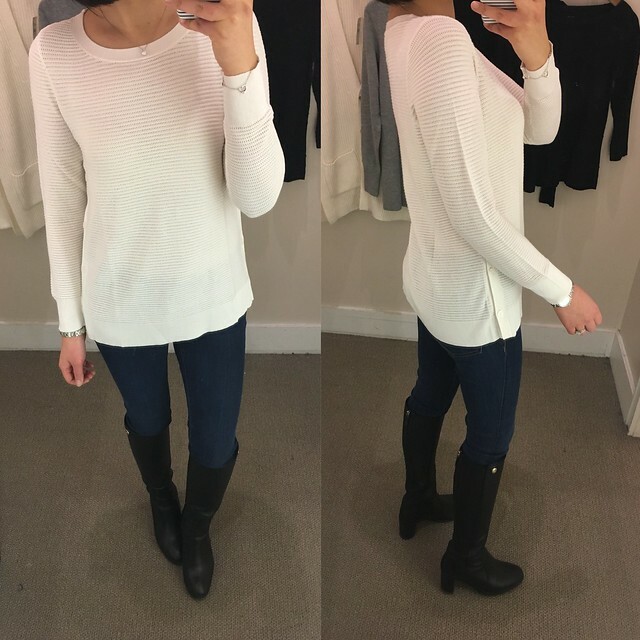 The sweater portion of this top looks and feels like very nice quality since some of their similar styles can have a more washed/faded look to them. I saw the front of this top on Taylor@taymbrown and I bookmarked it on Instagram so that I would remember to find it in store. I’ve come across it before but never tried it on and it looks so much cuter in person. I love the large pleats in the back. I found that this runs true to size for a loose/swingy fit as intended. It’s worth mentioning that the sleeves are slightly snug but not uncomfortably so. 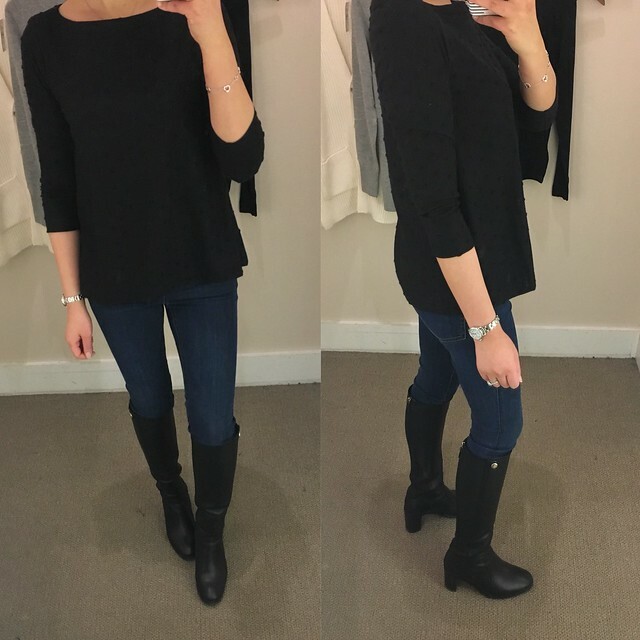 I debated long and hard whether to get this top but I left it behind for now as I currently have many unworn items in my closet and no shortage of grey sweaters and tops. If it’s still around next time then I may not be able to help myself. I’m a regular at the LOFT store over at the Prudential Center and I was chatting with Tati who recommended this new arrival. It fits true to size and I tried on size XS regular (see it on me here) and size SP pictured above. I preferred the body skimming fit and length of SP on me. The material feels like a thin spring sweater and it’s slightly sheer so a layering cami is required. 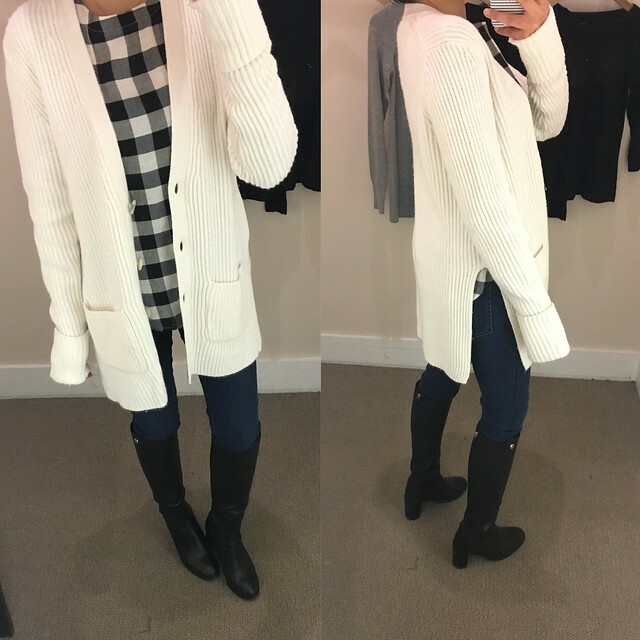 I love white/cream sweaters and the functional buttons going down both sides of the sweater. This sweater is currently available in select stores but it should be available for purchase online soon. The petite item no. is 429034 ($59.50) and regular missy is item no. 420828 if you call in store to check on the availability. Update 1/25: This top is now available for purchase online in regular missy sizes and it’s offered in three colors! This ruffle cuff top is another new to store arrival that is not yet available for purchase online. It fits true to size as XS regular was a bit loose on me so XXS regular would be the best fit. The ruffles on the sleeves drape well and they are not too poufy which I like. It also has a slightly longer length for those that prefer more coverage in the front and back for tops. This top is item no. 430686 ($44.50) if you call in stores to check for the availability. 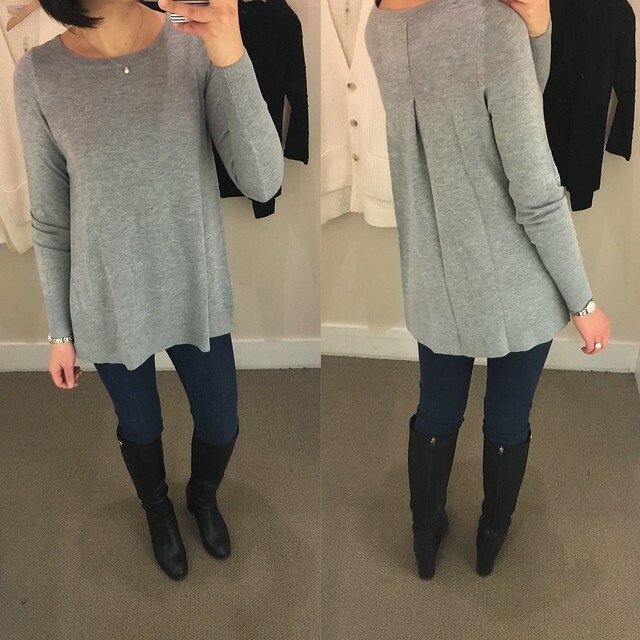 Update 1/25: This top is now available for purchase online in three colors! I spotted this pretty white cardigan last weekend but I didn’t get a chance to try it on. The thick, folded over cuff on the sleeves are sewn that way so you can’t change it. The sleeves of size XS regular run really long past my finger tips. I don’t like the high slit on the sides and if you have any hips then the slits kick out too much especially if you try to button the front. 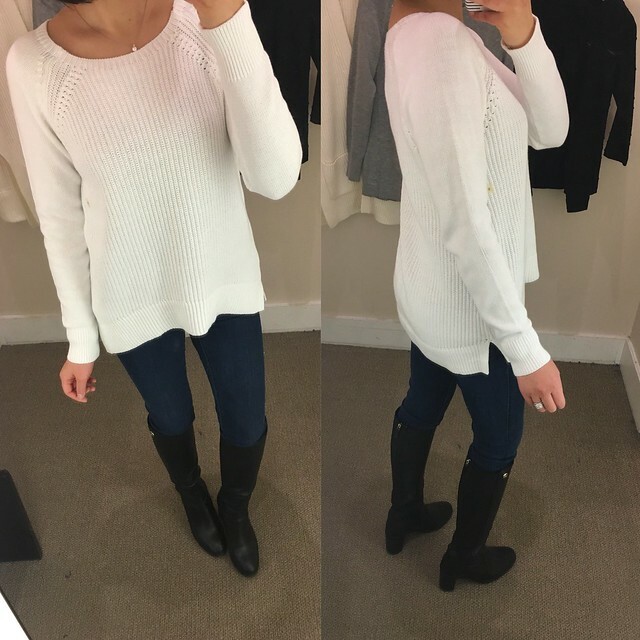 I spotted this pretty white sweater on the tables and I had to try it on for size. Size XS regular was gone so I tried on size S which fits me well. I’d say this sweater fits true to size but you can go up a size and still have room to layer a collared shirt underneath comfortably. This sweater is new to the select stores and not yet available for purchase online. This sweater is item no. 421404 ($59.50) if you call in stores to check for the availability. Update 1/25: This sweater is now available for purchase online in many colors! 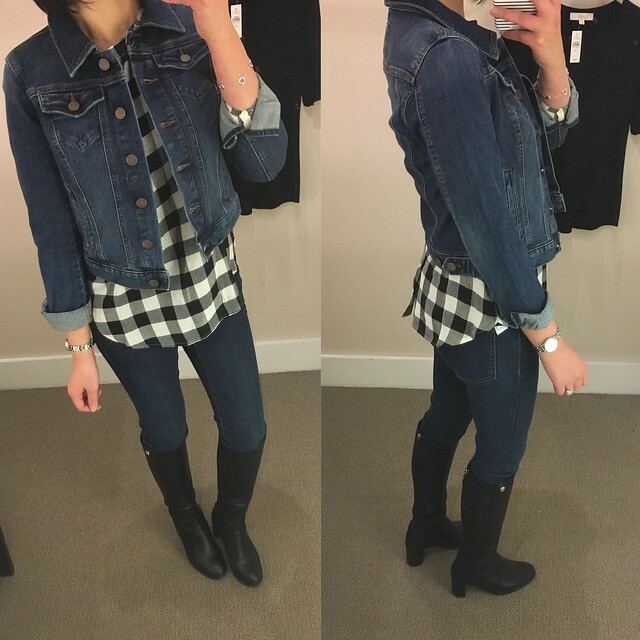 The cropped length of this denim jacket caught my eye so I tried it on for size. It fits true to size but does run a bit narrow in the shoulders (I have 14″ shoulders when measured across). I am trying on size XSP here which is my usual size at LOFT. I tried on this blouse in XSP during my Instagram takeover last week and I wasn’t sure how much I would wear this style so it didn’t come home with me. I really like the print so I decided to try on size XXSP for comparison since it does about one size larger. 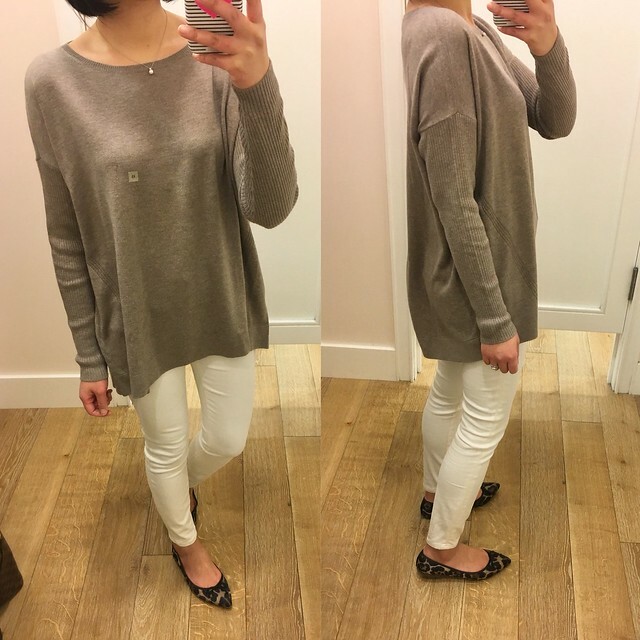 I have the similar cowl tunic sweater (last seen here, review here) and I really wanted this swing tunic sweater in the taupe color after seeing it featured on Jenn@hauteofftherack during her LOFT takeover. I finally found size XS regular to try on but I found that it has such a baggy fit throughout the body. It fits at about two sizes too big and I would need to size down to XXSP for the best fit. 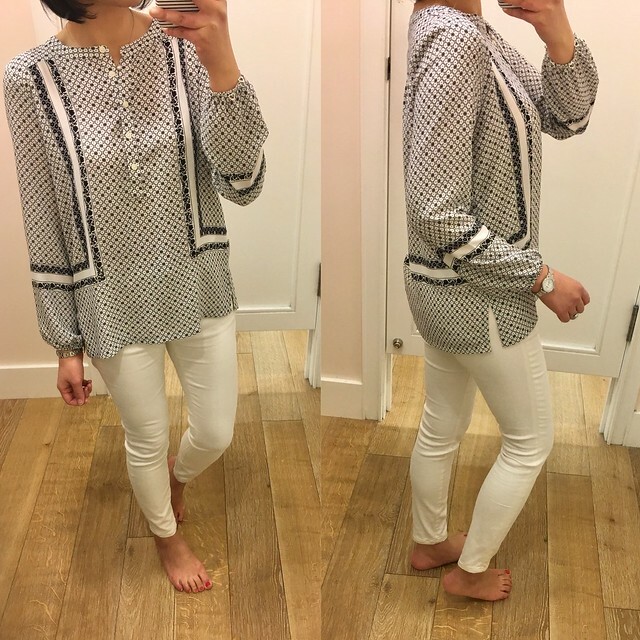 I previously tried on this top in size XS regular here but I passed on it due to the loose and boxy fit. I came across size XXSP yesterday and it fits me really well except that the sleeves were a big snug. If this top were offered in white I would be all over it since I’ve been wanting a white swiss dot tee for a while now. 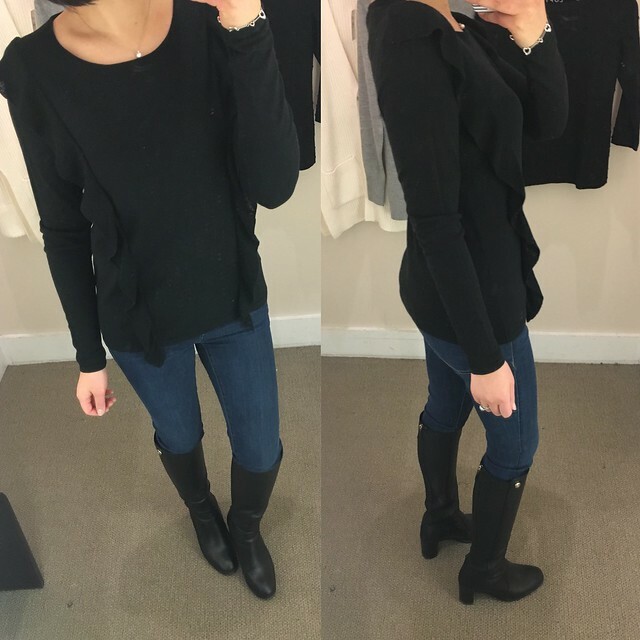 Lastly, I tried on this ruffle sweater in size XS regular since I found it in the sales rack and the fit had looked promising. It fits true to size but I wish the ruffles started mid-shoulder instead of at the shoulder seams.